Do these 5 things and you'll always be on time! 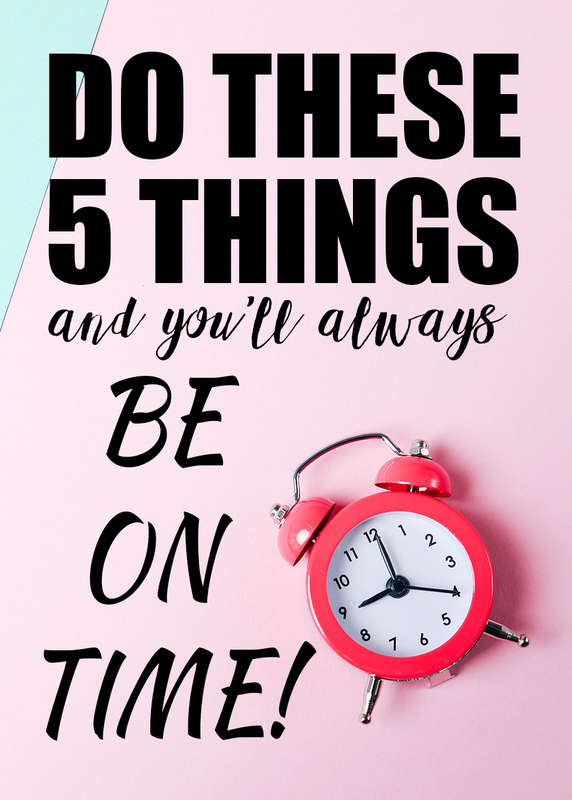 Do these 5 things and you’ll always be on time! I have to say that I have always struggled with getting where I need to be ON TIME! I don’t know if it’s just in my DNA or if I learned if somewhere along the way, but it’s been a pretty normal part of my life to arrive 5, 10, 20 minutes late. But as I’ve, ahem… matured, I’ve realized that being late is really a mindset issue and is totally self-sabotage. Now, I have a plan to handle this struggle and I want to share it with you so you can be on-time wherever you go. How to always be on time! Duh, right? No. What I’m really saying is set ONE alarm. If you’re like me, you’ve set 4 alarms on your phone and just keep letting them buzz and buzz. So, the new rule is to set one alarm at THE time you need to get up and get the freak up. No snoozing, no 5 more minutes. Put your feet on the floor and get out of bed when that alarm starts singing. You can use your alarm for appointments, too. I always set alerts on my phone, but I don’t always see them. THAT can be a problem. So, if I know I have something important to do that day, I’ll set an alarm for when I need to stop doing what I’m doing. I use alarms to tell me when to stop working and run get Brendan from school. It saves space in my brain because I don’t have to keep looking at the clock to see if it’s time to shut it down and go get him. Probably the single most helpful thing I’ve learned to do! Yes. First. Don’t get up and Facebook for 5 minutes that turns into 30. Don’t make your bed or brew the coffee. Go get in the shower, get dressed and fix your hair and face. Get yourself ready FIRST so you aren’t rushing through the process. Take what time you have to make sure you are clean and coiffed, dressed and ready. This was a huge game-changer for me. I would sit down and get sucked into Instagram for an hour and then have to rush around trying to get ready. Now I get ready first and then do other stuff, so when it’s time to leave, I don’t have to run and put my lipstick on first. It’s already there. 3. Put your appointments in your calendar for 10 minutes early. In other words, fool thyself. In fact, you can randomly change that number so you don’t always say… aha, I know I have 10 extra minutes! Do 5 minutes, 15 minutes, 10 minutes and change it up every time so you’re never sure what you’ve done. Then just get there early and smile inside at yourself. 4. Don’t start any new tasks right before you have to leave. If you’ve got 10 minutes before you need to be in the car and on your way, don’t go and start trying to sand down your china cabinet. Things always take longer than you anticipate and you can get sucked in and find yourself totally missing your appointment or event. If you are tempted to start something, just go get in your car and wait there for a few minutes. 5. Get your stuff ready to go the night before. My last tip is if you are still having trouble being on time, particularly in the morning, start waking up earlier. Go with 5 minutes the first week, and increase it by 5 minutes each week until you have plenty of time in the morning to get ready and not run around like a banshee trying to haunt yourself. Also, while you are doing this, go to bed the same number of minutes earlier. Just do it. Don’t complain or think about it. Stop telling yourself you “don’t have time”. You do have time. All the time in the world. Being on time is a part of good character, and it will make you feel good about yourself. 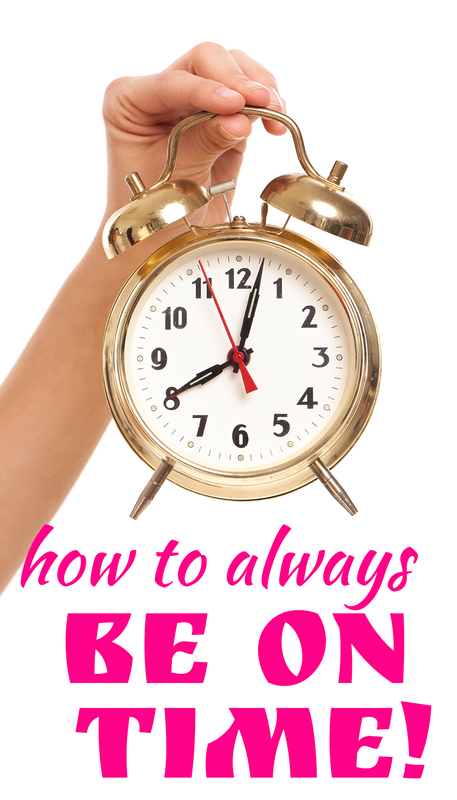 Aren’t you tired of feeling like crap because you just can’t seem to get anywhere on time? You have the power to change it, so change it. You’re not a 5 year old at the mercy of your momma. You get to decide what you do and when you do it. How’s that for some real talk? I know you can do this. And you’ll be better off for it. P.S. Do you have any other tips? Let me know down in the comments below! I’m going to try these tip, but I don’t want anyone to die of shock when I get there on time! Thank you for tip#2. I am guilty of this. The good side is I fix my bed after every bath and then have my breakfast. What I need to work on is ready myself before I start tinkering with my laptop. I can do this. I will start tomorrow.